An entire colony of threatened monkeys, including two thumb-sized babies, were among a haul of rare species stolen from a zoo, police have said. Experts fear the four-week-old black-eared marmoset infants, taken from Exmoor Zoo in Bratton Fleming, Barnstaple, Devon, could die. 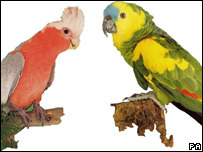 A pair of white-fronted marmosets, two pairs of parrots, a pair of cockatoos and a pair of Amazons were also taken. Zoo curator Danny Reynolds said the thieves were "stealing to order". The baby primates belong to a species classified as threatened. This colony was the only breeding colony in the UK. They are about 18in tall and normally live in the Amazonian rainforests of Brazil. Mr Reynolds said: "Those two little babies are going to suffer. It's what is going to happen to them that worries me. "Unless they are looked after by someone who knows how to care for them, they are going to die." Monkeys are a social animal and the stress does not always show immediately, he explained. He said it could take a month before these environmental changes affect them. Mr Reynolds added: "The babies were so young that we have not even named them yet because they are only just reaching an age where we could feel safe that they might survive." 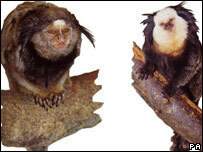 The white-fronted marmosets are an endangered species also from the Amazon. Mr Reynolds said: "These people have no right targeting a zoo. "They have targeted species which do not require a licence to be owned by a normal member of the public so I do believe they have been stealing to order." The curator admitted that he feared a decade's work to protect the black-eared marmosets had "gone down the drain". He said: "It is so much of our work just gone because someone can't earn a living in a normal way." A Devon and Cornwall Police spokesman said: "The police are currently investigating this offence and are keen to ensure their swift return of the animals for their safety and welfare."